Kingfisher Bay Resort And Fraser Island: Fraser’s Flockstars Put On A Spectacular August Concert! Fraser’s Flockstars Put On A Spectacular August Concert! No matter where you are in the world, we think it’s marvellous to wake up to the magic of birdsong – and with 354 different species of birds recorded on Fraser Island, you never know quite what warbling awaits of a morning. Kingfisher Bay Resort’s hotel wings, villas and houses were built to integrate with the natural environment. During construction, plants were taken from the build site; were propagated in our onsite nurseries; and replanted back in and around the property – to attract natural birdlife. So, if you are not a morning person and don’t wish to give up the comfort of your cosy room and join us on our early morning bird walks, you can still indulge in a spot bird watching from the comfort of your balcony (coffee in hand of course). Birdsong starts in stages. The first layer is the territory song. A good example of this is in our Laughing Kookaburras – the world’s largest Kingfishers (see left). Renowned as ‘Laughing Jacks’ in cultural folklore, the laugh is actually a verbal territory display, warning foolish rivals out of the family territory. 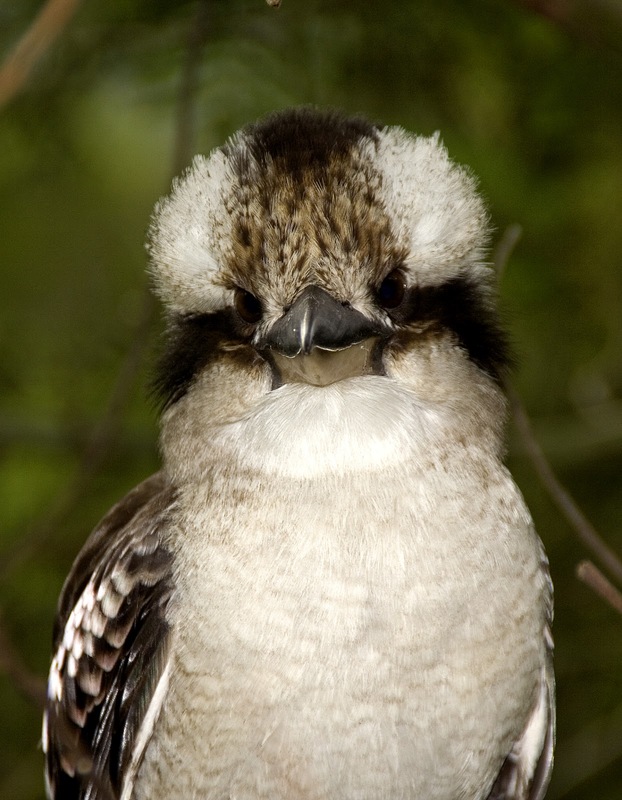 Ranger Fact: According to an Aboriginal legend, the Kookaburra’s laugh is actually a signal for the sky people to light the great fire in the sky that illuminate and warms the earth. Kookaburras are family-oriented birds. A group usually consist of one dominant breeding couple, other adult non-breeding birds, and immature birds from previous broods and juveniles .The adult non-breeding birds can be male or female, but not necessarily related to the dominant pair. They co-exist in a strict hierarchy and all pitch in to help with incubation, babysitting, feeding, teaching the chicks and defending territory. If you’re in and around Kingfisher Bay - either as a resort or tour guest or on a day trip from Hervey Bay - the best place to spot our Kookaburra family is down at The Sand Bar – just a short stroll from the resort main Centre Complex or Jetty Hut - where they command plenty of attention from our guests and provide great photo opportunities. They’re part of the Kingfisher family, and you may also spot their feathered relatives - the Azure and Forest Kingfishers flitting in and around the Wallum Heath at the front of the resort. The next to rise in the mornings are the nectar feeders. As the saying goes the early bird will get the worm – but in this case it’s the honey. Honeyeaters are prolific around Kingfisher Bay Resort and on Fraser Island. Already this month, we’ve spotted White-eared Honeyeaters, Noisy Friarbirds, White Throated Honeyeaters and Blue-faced Honeyeaters. One of the more rare sightings – for the twitchers amongst us - has been a pair of Red-tailed Black Cockatoos sighted along the Northern Lookout track. Although not strictly nectar feeders, Cockatoos and Parrots are always up early to stake out the best feeding spots. As the sun rises, our insect residents are the next to rise and add their song to the morning chorus. Rufous Whistlers, Varied Trillers and Eastern Yellow Robins are frequent guests in and around the resort. And considering your food needs to warm up to be caught, it is logical for these feathered hunters to indulge in a sleep-in. Morning are fabulous for bird watching on beautiful Fraser Island, so please stay tuned for more of our adventures or, better yet, come and join us on one of our Ranger-guided walks or talks on Fraser. This is Ranger Amelia heading off to go and sing with the birds.